TaiwaneseAmerican.org is proud to sponsor our second Living Room Session featuring singer-songwriter Alice Tong! We join Alice in her very own living room in San Francisco's Haight-Ashbury neighborhood. Special guests Mei-Ling (percussionist) and Stephanie Lai (cellist) will also join in the fun! The performance will stream live starting at 11:15 AM (PST) to the rest of the country. From this intimate living room setting, she'll share her stories, experiences, and songs with you! ABOUT THE ARTIST: Alice Tong is a singer, songwriter, artist, activist, social worker, 2nd generation Chinese-Taiwanese-American. Alice has a BA in Ethnomusicology and a Masters in Social Work. Her musical style ranges from such categories as folk rock, indie rock, soul, and jazz. Her music has been in independent films, including “American Fusion” which won the Audience Award at the Hawaii International Film Festival. Alice’s album “Small” can be bought on iTunes, Amazon, or www.blacklava.net. She now lives in San Francisco where she gets obsessed with her dogs and makes and performs more music. For more about Alice, check out www.myspace.com/alicetongmusic . Thank you for supporting TaiwaneseAmerican.org, our community, and our emerging celebrities! 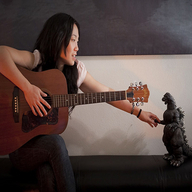 Singer-songwriter Cynthia Lin - Live!